This week, we concluded our two week study of the symbolism of trees in the Bible. The first week, we studied fig trees and we followed last Sunday with olive trees. Indented parts are notes from the discussion. If some of the branches were broken off, and you were a wild olive branch, and you were grafted in among the other branches and shared the root that produces the rich oil of the olive tree, then don’t brag like you’re better than the other branches. Last week, we talked about fig trees in the Bible. Figs were an important tree in scripture, signifying how believers should bear fruit. The olive tree is, perhaps, the most important tree mentioned in scripture. Today, we are going to discuss some of the ways olives, and olive trees, play a role in the life of the believer. The olive tree is hard to kill. It grows in extreme heat with little water. You can chop it to the ground, and new trees will sprout up from the root system and from the trunk. Some of the root systems in trees around Jerusalem are over 2000 years old. It is an evergreen and produces fruit in almost any soil. What might this signify in terms of the church? What is the common source of strength for all Christians? In this discussion, we had several ideas. The resilience of the olive tree should be reflected in our faith. We are to continue to do the next right thing even when life is difficult. We referenced back to an earlier study regarding God’s plans to prosper us and not harm us (Jeremiah 29:11) and looked at it in context. The people in Jeremiah are in exile and most will never see home again. God tells them to prosper where they are. They are to have families, go about their business, and prosper their captors as well. In faith, we are to prosper where we are. Every situation is a ministry opportunity. Our common source is Jesus. The analogy here was in regard to the twisted roots of the olive tree. As they grow together, they may have come from different sprouts but they work together. Christian denominations, and there are a lot of them, all have Jesus in common. We have to work together to grow. Like the tree in the photo, we grow together and become one in Christ. The olive tree is first mentioned in Genesis. In fact, it is an olive leaf that the dove brings back to Noah which signifies that it is safe to leave the ark. The olive, then, is a sign of hope. Since the time of the Roman empire, an olive branch has been a sign of peace – like the story of the ark it meant it was safe to venture out. Olive oil was/is used to burn in lamps, for cooking, in medicine, and for anointing. Jesus traveled to the Mount of Olives and prayed in Gethsemane, a garden of olive trees named, literally, the garden of the oil press. Grace is ever present in scripture. Sometimes, we overlook it when reading the Old Testament, but God’s grace is constant. We are saved by it. Here’s a nice article from a ministry about Grace in the Old Testament. Christians love to use the term grafted in (see opening passage above) but what does it really mean to be grafted in? In scripture, Jews are seen as cultivated olive trees, wild olive trees are gentiles. There are two ways, in growing olives, that wild trees are grafted in. 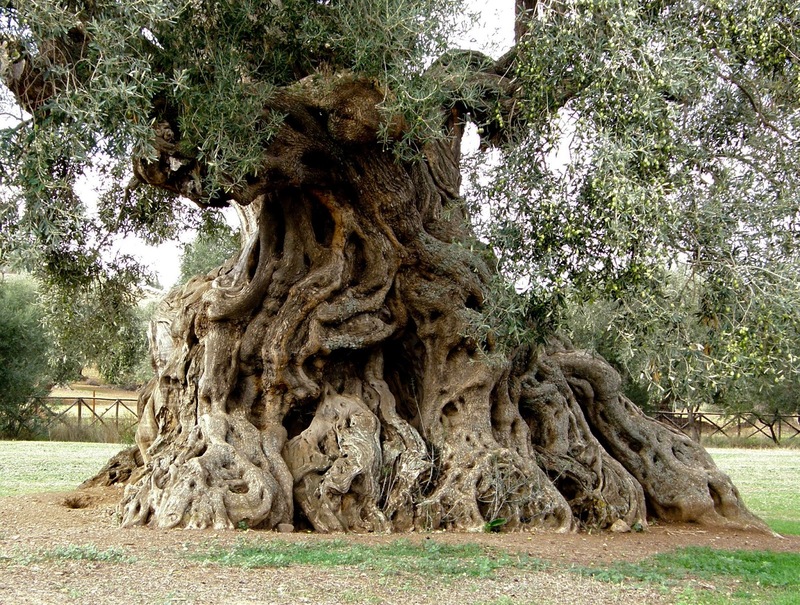 Many farmers would dig up wild olive roots and graft in branches from their groomed trees to grow new trees. But Paul says wild branches were grafted into the cultivated roots. Was he going against nature to illustrate a point? When a cultivated tree was sick, a wild branch would be grafted in to stimulate fruitfulness. How is this significant in our relationship with Israel? Last week, we talked about bearing fruit. In offering the message of the Jewish Messiah to the gentiles, Paul made the analogy that those who rejected Christ were not bearing fruit. So, “grafting in” is symbolic of the second example where the gentiles were to bring new life to the tree. Paul warned Christians not to be arrogant because we are fed by our Jewish roots. Even though the branches serve to preserve the fruit of the tree, salvation comes first to the Jews and then to the gentiles. As Jesus also said, he came for the lost of Israel. Many Christians teach that we have replaced Israel. The church has not replaced Israel, we have become part of it through Grace. In fact, we are the branches and our spiritual life is fed by Israel. Note that not all branches were pruned and also note that many will be grafted back in. God’s covenant remains intact. Obviously, we are to be kind to everyone. We don’t always do that. I asked this question specifically because of Paul’s comment that we are fed by the roots and even though our branches are now part of the tree, we are not the tree itself. This discussion brought up our previous studies of Jewish views on death and the afterlife, Christian evangelism, and God’s promises to us all. It’s a tough question and could be a lesson all to itself. When a new olive tree is planted, it can take 15 years for it to bear first fruits. How does this illustrate God’s grace and patience with the church? How does this compare/contrast with the story of Jesus and the fig tree? God grooms each of us for a purpose. Some people do not find their purpose until they are much older in life. However, every believer is capable of bearing fruit. The fig tree, though immature, was expected to bear fruit. The olive tree, which matures later, bears fruit after much pruning and care. We all have a purpose. End Note: The return of Christ, according to prophecy, will be at the Mount of Olives. The olive tree has played an important role in the life of the church and will play a role in the establishment of the kingdom here on earth.